What and who do you find inspiring? An article from “Evolve College”. “We grow enormously by being inspired by others in life. Every one of us provides a reflection to all around us, all of the time. The quality of that reflection either offers someone the potential to recognise its quality, and be inspired to step it up themselves, or it offers them far less. 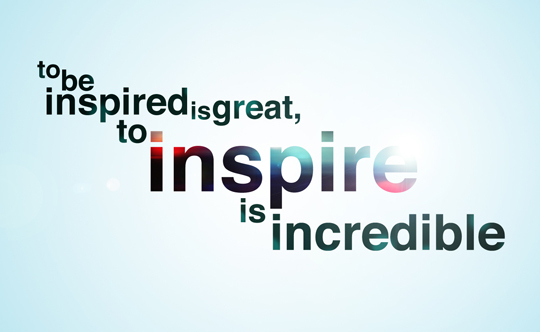 So what is truly inspiring? It is truly inspiring when we come across someone who really walks their talk and is the ‘real deal’, so to speak. • The real deal is someone who genuinely considers all around them, without need for feeding or aggrandising themselves in the process. • The real deal takes care of themselves as deeply as possible, knowing that this provides the basis for what they can offer others. • The real deal does not hold back on what needs to be said/shared – they know that the truth honours us all, even if we sometimes do not want to hear it. • The real deal realises they are part of something much greater, and thus the way that they treat themselves, and all others equally, contributes to the quality we all experience in the society we share. • The real deal is not perfect, and is humble in knowing this, but enjoys their part in the whole, and is committed to bringing their all. Every now and again we come across someone who is the real deal, and they offer us so very much. We can be truly inspired, knowing that if they are living that way, then so can we – as they are showing us it is possible. This can be a massive ‘lift’ for us, as we can decide to escalate and go for it ourselves. OR, instead of being inspired, we can go into reaction and sometimes we can actually target the person who is showing us the reflection. The effect of this is usually to try to ‘take them down a notch or two’. However, if we are willing to look at what is really going on, we may find that it is not the person we are reacting to… We may find that we simply do not like the reflection because, underneath it all, we know we could have done exactly the same thing – except that we know that we chose differently. What we can see from this is that it is not about the other person at all, but the fact that it is our very own choices that we are faced with, and that we do not like, or that we may even regret, as the case may be. Either way, seeing a person who is the real deal is a beautifully refreshing thing, and offers us a fresh start, where we can choose to step it up and bring more of ourselves, just as we see them doing. After all, deep within, we are all absolutely equal, and therefore equally as capable of reflecting what is true and grand and which brings out the best in ourselves and others. It is very easy to see what the potential is for the world as a whole, if we all chose to live that way. Hence, there is much to appreciate in and about those who do choose to offer us inspiration. Next Post What if people are doing the best they can?